34189 Fairy Maiden Water Fountain home decor, jewelry, decor, decorations, electronics, fountains, floor mats, art glass, vases, garden essentials, fireplace screens. 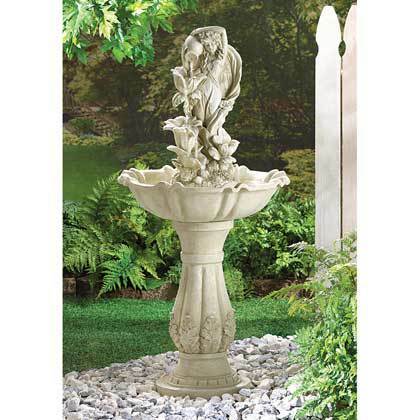 34189 Fairy Maiden Water Fountain, Free Shipping !!! A fetching fairy maid pours water in sparkling tiers down a series of open blossoms. A splendid centerpiece for your garden! Comes with an electric water pump. UL Recognized. Fiberglass. May require additional freight charge. 19 1/2" diameter x 42" high.